NOTICE! You can Raspbian images with the Pi-Pan software pre-installed at the bottom of this page. Pi-Pan works with standard Raspbian distribution. 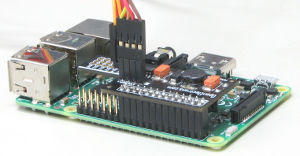 The Pi-Pan controller board connects on the Pi as in adjacent picture. (On all models of Raspberry Pi, Pin 2 is the corner pin). 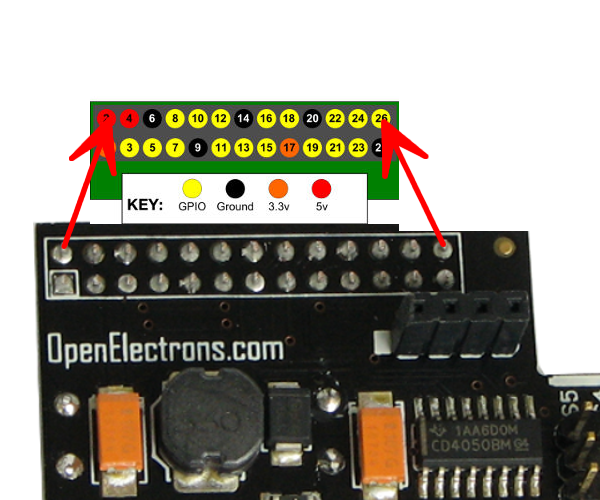 Attach the controller board on GPIO pins (as in picture above). Attach Servo wires on servo pins. (Connect the wire so the yellow-orange wire is near the white line on the PCB). Check that you have connected servo pins correctly. First pin on Pi-Light connector has a White square background. Also there is a White square near the first pin on controller board. the pins with White square backgrounds match on both ends. (i2c-tools are not needed for Pi-Light to function). Below are few of Raspbian images with Pi-Pan software pre-installed and configured. Use one of this image on your Pi to troubleshoot Pi-Pan or Pi-Light. http://www.mindsensors.com/largefiles/2015-05-13-wheezy-raspbian-2-16-with-pi-pan-check.zip (This image will start pan-tilt mechanism and pilight as soon as Pi boots up - use for troubleshooting on Wheezy). Unzip the file, and set up your SD card. (refer to 'Create your own' section).